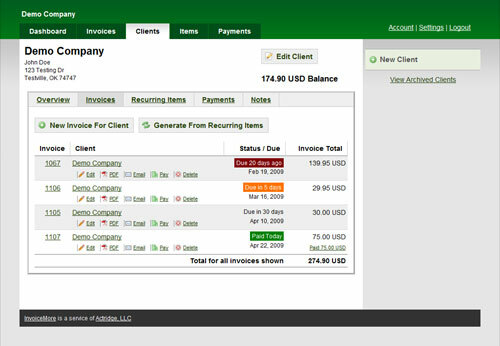 Everything you do for clients can be easily found from within the client view - invoices, items, payments, and all other activity. Find what you're looking for, and get off the phone faster. InvoiceMore is the most client-centric online billing service on the market. Get a quick overview of all the recent activity, how many invoices are overdue, and how much you are owed. See invoice dues dates and statuses. Edit, download, email, and add payments to invoices directly from the invoice listing. Manage clients and access their invoices, recurring items, payments, and notes. Setup your products, services, and packages as items that can be re-used throughout your account. Manage and record payments or credits for invoices or clients. Automate your recurring billing process. Invoices are automatically generated from recurring products and services. Keep private internal notes about phone conversations, decisions, services performed, and more.